Leaders of the North Atlantic Treaty Organization have rebuffed a proposal from Russian President Dmitry Medvedev to unite Russia's missile defenses with those of the West, said diplomats and NATO officials. At a closed-door meeting with NATO leaders in Lisbon Saturday, Mr. Medvedev suggested uniting a missile shield being built by the 28 allies with Russia's own missile defense system. People attending the summit said President Barack Obama and other leaders diplomatically rejected the Russian leader's proposal, saying the issue should be looked at by the countries' technical experts. The experts will look at ways the two systems can cooperate and report to a meeting of NATO and Russian defense ministers in Brussels in June. 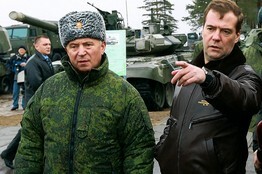 President Medvedev, right, visits the Gorokhovetsky training ground Thursday. NATO diplomats said the Medvedev proposal goes way beyond what the alliance envisages, which is cooperation and information sharing between two systems rather than a single system. "We're looking at two different systems linked up," said a NATO spokeswoman. Mr. Medvedev's told a news conference afterward that his proposal was for "sectoral missile defense." Russian officials later said Mr. Medvedev proposed that Russia and NATO countries would be responsible for shooting down missiles flying over their own territories and Russia would destroy missiles headed for NATO territory. Dmitry Rogozin, Russia's ambassador to NATO, said in an interview with the Russian website Vzglyad that Mr. Medvedev's proposal "goes much further than NATO's fantasies" of limited cooperation. "Medvedev is effectively proposing to create a collective missile-defense system along the perimeter of the Euro-Atlantic region. It roughly amounts to agreeing not to keep missile-defense systems inside the region—something that raises our suspicions—and arrange for the system to be pointed outwards." The proposal would mean the NATO system's sensors wouldn't be pointed toward Russia, which is sensitive that the system could blunt its own nuclear deterrent. Mr. Rogozin "tweeted" from the summit that the Russian approach was "reminiscent of two knights who, defending themselves from attackers, stand back-to-back." Governments were left puzzling about whether Mr. Medvedev's proposal was an initial negotiating position or a spoiling gesture, diplomats said. But NATO leaders reacted diplomatically because most welcome the prospect of improved security cooperation with Russia, and that missile-defense cooperation offers benefits to both sides. President Barack Obama publicly welcomed Mr. Medvedev"s presence at the meeting, describing him as "my friend and partner." The decision to cooperate on missile defense "turns a source of past tension into a source of potential cooperation against a shared threat," he said. Skepticism over the proposal isn't limited to NATO governments. Nikolai Makarov, chief of Russia's General Staff, said in the official Rossiiskaya Gazeta newspaper that the idea of Russia shooting down missiles headed over its territory for Europe and vice versa was simplistic. "For military men on both sides, this supposition looks, to put it gently, far-fetched. The fact is that any country with missile-defense systems would shoot down missiles approaching its borders without any international agreements." Alexander Golts, an independent military analyst and deputy editor of the Russian news weekly Yezhenedelny Zhurnal, wrote that Russia isn't currently capable of mass producing suitable ballistic missile interceptor systems. Russia only has the S-400 system, of which it has only two batteries, just outside Moscow. "If this is the case, then Moscow has practically asked NATO to drop missile defense," he wrote. Despite the apparently conciliatory signs on missile defense, the Kremlin hasn't given up its goal of expanding its global military reach. On a visit to a base in central Russia Thursday, Mr. Medvedev said the government is looking for ways to build new military bases abroad to support its navy on long-distance missions. "I won't hide it from you, we have some ideas about this," Mr. Medvedev said in comments carried on state television. "Unfortunately, it turned out that a series of our country's previous capabilities disappeared," he added, an apparent reference to Soviet-era bases in Cuba and Vietnam that Moscow gave up about a decade ago.